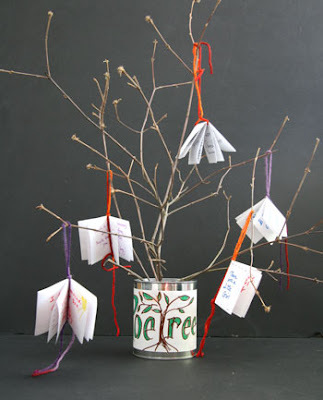 Last fall I made a "PoeTree" by hanging small books with a poem written in each on branches I placed in an empty can. I'm taking the idea of poems on trees out into the community with The PoeTree Project as part of the Newburyport Literary Festival at the end of April. Students at the Nock Middle School are writing short poems on strips of tyvek which will hang from trees in the downtown area and in front of the Festival venues. I was inspired by an image of Japanese folding screen from the Art Institute of Chicago. This month's project is a PoeTree. Fun at any time, it is especially appropriate for National Poetry Month which is next month. I made small books from used 8.5 x 11 copy paper that had writing on one side. If you use repurposed paper, the writing should be on the inside when you make the first (hot dog) fold. I chose short poems by some of my favorite poets but you may want to write your own. To make the hanger, you'll need a piece of yarn about 24" and a bead. 1. Fold one piece of yarn in half and thread folded end through the bead. Leaving a loop for hanging, tie a knot with the bead inside the knot. If you don't have a bead, you can just tie a knot. 2. Place the bead on top of the book and separate the two ends of yarn. Place one along the outside spine of the book and the other inside along the center of the book. 3. Tie a double knot at the bottom of the book. A thorough and fun poetry lesson with Jack Prelutsky. Website of Bruce Lansky chock full of poetry and information: Poetry Class, Poetry Fun, Poetry Theater, and lots more.